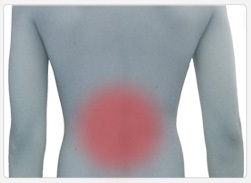 Back pain is a widespread malady affecting millions of Canadians. Most people simply endure the pain without seeking any professional help. Back pain has many causes. One of the primary causes is poor body posture. When sitting at a computer or watching TV many people tend to slouch. Poor posture can also occur when standing for long periods. Posture can gradually erode over time. Many people are not aware of their posture. Poor posture often starts at the feet! When the feet pronate excessively (roll inwards) the entire body can be thrown off balance. Excessive pronation can lead to the legs rotating inwardly while the pelvis tilts forward. This results in amplified spinal curvature and unrelenting tension in the muscles of the lower back. This causes aches and pain. People suffering from low back pain, particularly after long periods of standing or walking, might consider the cause as emanating from their feet. A study in the United States recently identified characteristics of a person’s gait as contributors to chronic lower back pain. Participants in the study, all suffering from low back pain, experienced a surprising 68% improvement in low back pain after being fitted with foot orthotics. Footlogics orthotics reduces excessive pronation. This curtails the internal twist of the legs and forward pelvic tilt. This improved body posture significantly relieves tension on lower back muscles. This relieves associated pain and fatigue. It is recommended that orthotic inserts be coupled with a daily regimen of stretching and strengthening exercises. One example is the stretching of the hamstrings. This reduces strain in the lower back. It is also advisable to seek care from a physiotherapist.